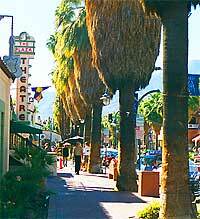 Palm Springs is comprised of 50 square miles of desert, and 34 square miles of hills rising above the desert floor in the Santa Rosa Mountains. Known as the Golf Capital of the World, private and city-owned golf courses are matches for the novice and pro alike. 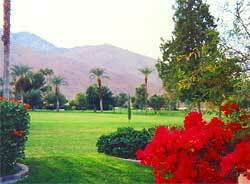 Palm Springs Hails its own Ted Robinson designed Tahquitz Creek Resort Course, as well as the Resigned Legends Course. When you breeze into town you never know what special event or activity is going on. There is always something to do. The Village is a mixture of festivals, historic sites, and unique up-scale boutiques, restaurants, and quaint outdoor dining. The Majestic Mt. San Jacinto backdrops the central business district. 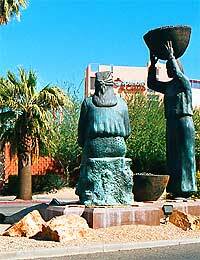 Alternating sections of land are held by the Agua Caliente Band of Mission Indians. Pristine Palm Canyons, waterfalls, big horn sheep, desert flora and fauna, "wind farms", and unique horseback riding and hiking trails attract visitors from around the world. Also, while shopping or sightseeing, don't be surprised if you bump into one of your favorite movie stars. 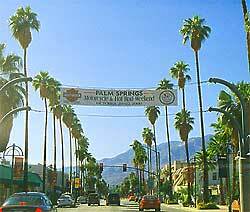 Palm Springs is also famous for their hotels and casinos laden with historical landmarks. 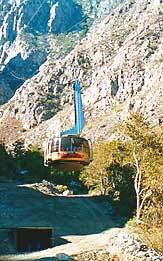 The Palm Springs Aerial Tramway boasts the single longest span of cable and carries passengers from the desert floor to snow-capped mountains in just minutes. The brand new 360 degree rotating cars are spectacular. This is a once in a lifetime adventure everyone will enjoy!